You have a right to go about your life without fear of injury caused by another party's negligence or misconduct. Should you suffer such an injury, you have a right to pursue compensation from the party that caused it. This is the foundation of personal injury law as practiced in Atlanta and throughout the country. And it is the philosophy of Watkins, Lourie, Roll & Chance. Our personal injury lawyers stand ready to help in the aftermath of your catastrophic personal injury. We understand the seriousness of your injuries and know how to navigate the legal system to help you secure the total compensation you are due. If you live in the Atlanta, Georgia area and need an experienced personal injury lawyer, please call Watkins, Lourie, Roll & Chance at 404-760-7400 for a free consultation. "Personal injury law" is a broad umbrella term that encompasses a massive number of case types. As such, it is important when choosing a personal injury lawyer to find one who has experience in the specific case that is relevant to you. This is far from a comprehensive list. To find such a list, please visit our "Practice areas" page. However, this does provide you with an excellent idea of the breadth and depth of our experience. It is important to remember that insurance companies may offer you a settlement following injury sustained in an accident. These settlements are often well below what is needed and what is deserved. One of the most effective ways to secure full and fair compensation is working with an experienced and proven personal injury lawyer who is willing to take your case as far as needed to help you get justice. The injury attorneys at Watkins, Lourie, Roll & Chance are here to do just that. Contact us today for a free consultation to learn more. Every personal injury case is unique, and no lawyer can promise you a specific result or monetary figure. If you speak with a lawyer who tells you that he or she can absolutely guarantee x dollars in a settlement, that attorney is being unethical and you should find other representation. Medical Expenses or Future Medical Expenses: If you have substantial medical bills or need continued medical care or physical therapy. Disfigurement: If you have suffered mental anguish as the result of a permanent disfigurement. Funeral Expenses: In wrongful death cases, funeral expenses may be eligible for compensation. Lost Wages: Wages lost due to the inability to perform your job duties. Lost Earning Capacity: If you lose the ability to continue in your career and are unable to earn an equivalent salary in another field. Pain and Suffering: Both physical pain and suffering as well as the loss of enjoyment of life due to an inability to continue with hobbies or pastimes. Household Services: If you require help around your house for things you would have been able to do for yourself if not injured. Home Modifications: If you require accessibility modifications to your home due to permanent injury. Each personal injury case is examined under its own set of circumstances, and compensation is awarded for specific criteria. Our personal injury lawyers have the experience needed to navigate this complex system and to help you get the compensation you are entitled to in each of these areas. Getting compensated for all of your damages is one of the most compelling reasons to hire a personal injury lawyer, but not the only one. Many people are naturally conflict averse. When they suffer an injury as a result of someone else's misconduct, their instinct is to shrug it off, tell themselves that the accident wasn't that severe. They try and work out the problem with the other party, believing that they can just reason it through. There's a certain nobility to this idea. Unfortunately, it often results in an innocent victim losing the chance at compensation he or she deserves. You don't want to try and muddle your way through a complicated legal and medical conflict all by yourself. Our personal injury lawyers have decades of experience helping victims in the Atlanta area. You might not think you need us, but lived experience makes it clear that retaining an attorney is crucial. Let's take a relatively simple and common scenario to illustrate the point. You're involved in a relatively small-scale car accident- a fender bender, basically. The other driver is a reasonable sort. You have some mild discomfort, but nothing severe or debilitating. Your car will be out of action for a few days, but the damage isn't catastrophic. Surely you don't need a personal injury lawyer for this situation, right? What happens if the reasonable driver starts thinking things over and decides you were to blame? What happens if the insurance company starts raising prickly questions and expresses reluctance about paying out? And what happens if your mild discomfort becomes significant pain and prevents you from working? All of this has happened before, and all of it will happen again. If you have a lawyer on your side, you'll be prepared for it. If you don't, these problems will likely come as huge surprises, and you won't know how to deal with them. Mild injuries become significant injuries. Simple accidents become complicated accidents. A pleasant solution between two reasonable people devolves into bickering. You need to protect yourself. There are no guarantees in the law. But our personal injury lawyers understand how to deal with insurance companies, and we have the experience necessary to navigate the often complex cases in our efforts to secure maximum compensation. Many accident victims are reluctant to speak to our Atlanta personal injury lawyers because they're worried about financial matters. Without experience in the legal system, they believe they can't afford an attorney. This is unfortunate. The legal system does not exist just for the powerful and privileged. It's a place where every American can seek justice, regardless of economic status. At Watkins, Lourie, Roll & Chance, we are committed to this principle. This is why we handle cases on a contingency fee payment system. This means we only get paid if you win a verdict or settlement. Popular culture is filled with portrayals of litigious, ambulance-chasing attorneys. In these portrayals, a personal injury lawyer eagerly seeks and accepts any case, confident that they can parlay it into a big payday. The reality, of course, is quite different. A contingency fee payment system works like this: you will make no payment to us when we decide to accept your case. There is no upfront payment required to retain our personal injury lawyers. We then pursue your claim with the passion and skill for which we are known. Again, you will not pay us anything while the case is still active. Payment comes after the case is complete and once a verdict or settlement has been reached. Our lawyers are paid a percentage of the verdict or settlement you are awarded. This means that if we do not win a settlement or verdict for you, we don't get paid any fee. The exact percentage of the verdict that goes to our lawyers will be determined before the case begins. We are always open and upfront about our payment system. We will ensure there are no surprises. If attorney’s fees are keeping you from seeking justice following serious injury, give us a call. Your consultation is free of both cost and obligation, and will give you a better opportunity to understand your rights, your options, and the best way to move forward with your case. While this documentation is helpful, not having it should not deter you from making an appointment with us. We can still discuss your case and what the next steps might be. Prior to meeting with one of our attorneys, you should research our firm and come to the initial consultation with questions for us. While we will ask questions about your claim during the first appointment, this is also your time to question us and learn more about the firm. The initial consultation with us is free with no obligations. Any information that you share with our attorneys is strictly confidential. We will discuss with you the specifics about your case, asking you questions to recall the incident in detail to get as concise and clear remembrance of that day as possible. With this information, we can determine if your case qualifies for legal action and help you determine how to move forward with your claim. One statistic surprises many of our clients: the vast majority of legal cases are settled out of court and never reach trial. This can be surprising because television and movies tend to focus on the drama of a courtroom trial. A group of lawyers going back and forth in a conference room isn't terribly interesting or dramatic. 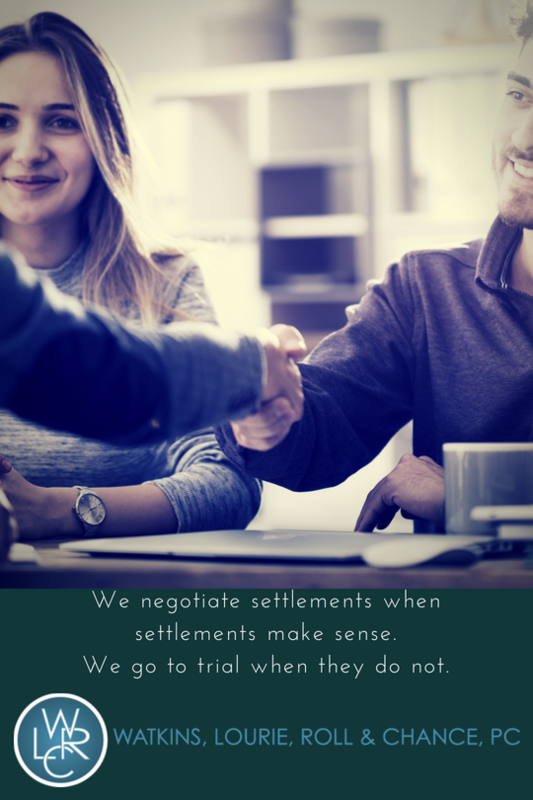 But those negotiations are absolutely crucial for our clients, and our Atlanta personal injury lawyers approach them with the seriousness they deserve. The settlement you receive can represent a crucial lifeline in a difficult moment in your life. When we accept your case, we also accept the responsibility to advocate tirelessly on your behalf. We are obligated to work, within the ethical bounds of the legal profession, in your best interests. In settlement negotiations, this means using a wide range of negotiation tactics to try and get the best deal possible. Defense lawyers go into a settlement negotiation with the intent of keeping the financial damage to their client as small as possible. To do so, they will try a number of different approaches. They will bluster. They will make lowball offers. They will cry poverty. They'll claim they're unable to budge so much as one cent from an offer. They'll say they are more than happy to go to court. There's absolutely nothing wrong with these tactics, but that's just what they are, tactics. Our Atlanta personal injury lawyers are unmoved by these campaigns. We have a sterling track record of winning verdicts and settlements for our clients. Our personal injury lawyers have been conducting settlement negotiations for decades, and we understand how to make sure our clients' interests are represented in these negotiations. When an insurance company says they can't offer more than a certain number, we understand how to evaluate it. We know what a fair offer looks like. We won't be bullied, intimidated or fooled in settlement negotiations. We will continue to fight tirelessly until your case is resolved. While no personal injury lawyer can promise you a specific settlement amount, the importance of experience in these negotiations cannot be overstated. This makes your choice of personal injury lawyer all the more important. With decades of combined experience, the personal injury lawyers at Watkins, Lourie, Roll & Chance have a long and impressive history of securing large verdicts and settlements for our clients. What’s more, successes fought for by our attorneys have earned them distinctions including Super Lawyers, multiple “Excellent” ratings from AVVO, and a preeminent rating from Martindale-Hubbell. These distinctions are testament to our dedication, but not what drives our practice. What drives our practice is helping victims of serious injury get justice - and that is exactly what we do. Every day of the year. Do you need help? 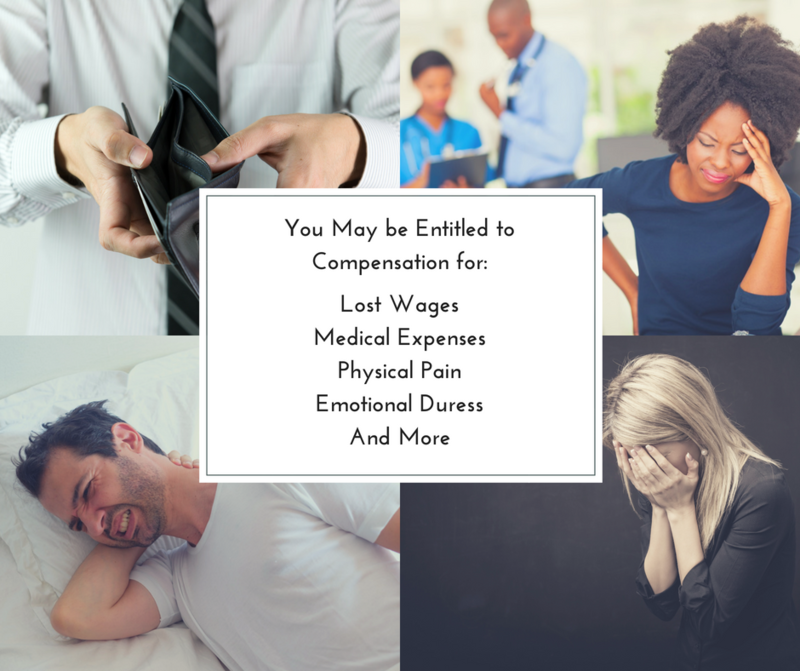 We are here to listen to you, offer honest and clear advice, and work to ensure you are treated fairly while seeking the compensation you are entitled to. If you are in need of a personal injury lawyer in Atlanta, please call Watkins, Lourie, Roll & Chance at 404-760-7400 to schedule a free consultation. We welcome clients from Savannah, Columbus, Decatur, Augusta, and all surrounding areas of Georgia.